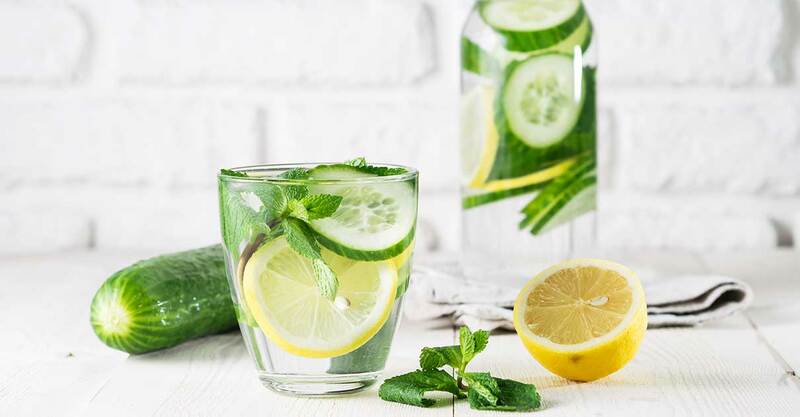 Detox waters have become quite popular in the world of health and nutrition ( click here to learn why), and lemon and cucumber top the list of ways to add extra nutrition to your water. Both are not only light and refreshing but can offer some very real health benefits. To make each, all you need is clean, filtered water and cucumber and/or lemons. For lemon water, simply squeeze the juice into your water, and with cucumbers you can add slices to the water and refrigerate for about an hour so that the cucumber will have time to infuse. Drinking water is critical to optimal health (here are 16 reasons why), and adding lemon and cucumber can make it easier to stay properly hydrated, while also adding an extra nutrient boost to each glass. Now, let’s look at the specific benefits of each. Cucumbers are high in vitamin K, molybdenum, potassium, copper, phosphorous and more (1). They are also extremely low in calories, making them the very definition of nutrient-dense (a food that offers high nutrient value per calorie). Cucumbers are also very high in polyphenols such as lignans, flavonoids and triterpenes, all of which are largely responsible for cucumber’s health benefits. Cucumber has a high water content and can be a refreshing and cooling addition to a hot day. They certainly don’t say “cool as a cucumber” for nothing, and adding cucumber to your water can encourage you to stay hydrated, especially on days you might be sweating more than usual. Cucumbers contain the antioxidants vitamin C, manganese and betacarotene, all of which are highly anti-inflammatory. Furthermore, cucumber extracts (higher, therapeutic doses) have been used to treat inflammation in animal studies (2). While further studies are needed, a lot of interest has developed in the group of compounds found in cucumbers called cucurbitacins, which initial research suggests could interfere with cancer cell proliteration (3). Lemon provide a whopping 52 mg of vitamin C, which is more than 50% of the daily recommended intake (DRI) (4). Studies show that eating vitamin C rich foods is important for heart health and reducing your risk of stroke and heart disease (5). Along with vitamin C, lemon also provide an impressive array of plant compounds that also support heart health and can also work to reduce blood cholesterol levels. Whether weight loss is your goal or not, you might be surprised to know that including lemons in your diet can boost weight loss efforts. Lemons are high in a type of finer called pectin, which has been shown to increase your feelings of fullness, which can reduce your overall calorie intake and curb cravings (6). Animal studies have found that the polyphenols in the lemon fruit can also work in and of itself to prevent weight gain (7). To reap maximum weight loss benefits, be sure to drink adequate amounts of water (both lemon and normal water). Check out our article on how much water you should drink per day. Kidney stones are crystallized stones that can accumulate in the kidneys and can be extremely painful. The citric acid content of lemons and lemon water can help to increase the body’s pH (acidity level) of urine and overall urine volume, which can in turn decrease kidney stone formation (especially in those predisposed to kidney stones) (8). Remember not to add sugar to your lemon water, as a diet high in refined carbohydrates and sugars can undermine the kidney-stone preventing benefits. Another great water for kidney prevention is coconut water. Lemon juice and lemon water can boost the body’s ability to produce stomach acid, which plays a key role in digestion (especially that of proteins). Drinking a small glass of room temperature or luke warm lemon water before meals can help to improve digestion over time, and might be particularly helpful if you suffer from acid reflux. Which is Better to Put in Your Water? While both make excellent additions to a healthy diet, lemon water does offer slightly more health benefits than cucumber water. Or, get the best of both worlds and make a cucumber-lemon water combination. Both are helpful too in ridding the body of extra water weight. Remember to choose the cleanest water possible so as not to undermine your efforts, as many city water supplies are, unfortunately, loaded with toxins. When Should I Drink Cucumber and Lemon Water? While you can enjoy these healthy and refreshing waters any time of day, try drinking lemon water first thing in the morning on an empty stomach. While lemons themselves have not been proven to support detoxification, water in general is key in eliminating waste and promoting regular bowel movements (although be sure your water is free of toxins), and adding lemon to your water gives you the benefits listed above. Cucumber water can also be great in the morning, but can also be enjoyed throughout the day for equal benefits.